cells of the leaves and improve their translocation into the plant. 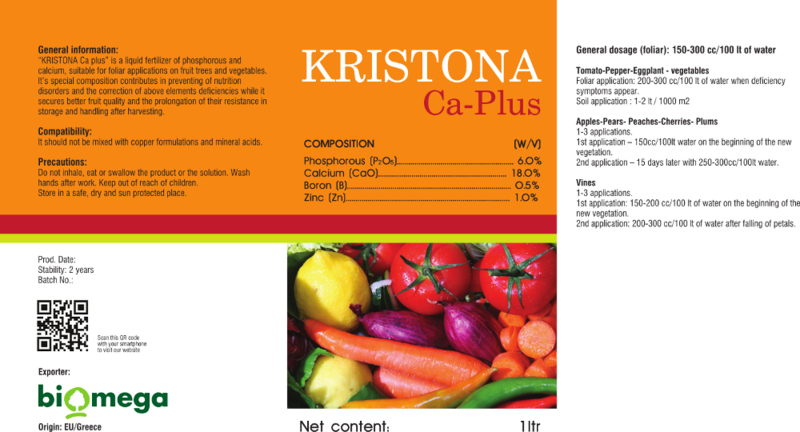 Moreover, the natural biostimulants that are contained in KRISTONA Ca-Mg strengthen the root system, increase cell division and fruit growth and improve their qualitative characteristics as well. Calcium increases the post harvest perservation period and prevents abnormalities, such as blossom end rot in tomatoes and bitter pit in apples. Magnesium supports the photosynthesis capability and also participates in the improvement of qualitative characteristics. Press on table title to see fullscreen. "ESC"or "x" to close.